Live from the Royal Albert Hall, the BBC Symphony Orchestra conducted by Sakari Oramo in Sibelius, Elgar's Symphony No 3 and Saint-Saens's Piano Concerto No 2. Live at BBC Proms: the BBC Symphony Orchestra conducted by Sakari Oramo in Sibelius, Elgar's Symphony No.3 (completed Payne), and Saint-Saëns's Piano Concerto No.2 with Javier Perianes. The novelist Meg Rosoff and art curator Karen Serres consider unfinished works in literature and in painting, and whether or not it is always a good idea for other people to finish them. Ian McMillan hosts. Recorded earlier as a Proms Extra with an audience at Imperial College. Producer: Jacqueline Smith. This year's Elgar cycle concludes with the originally unfinished Third Symphony. The concert also features the vivid, descriptive miniatures of Sibelius's Scènes historiques and Saint-Saëns's brilliantly youthful Second Piano Concerto. Composer: Anthony Payne. 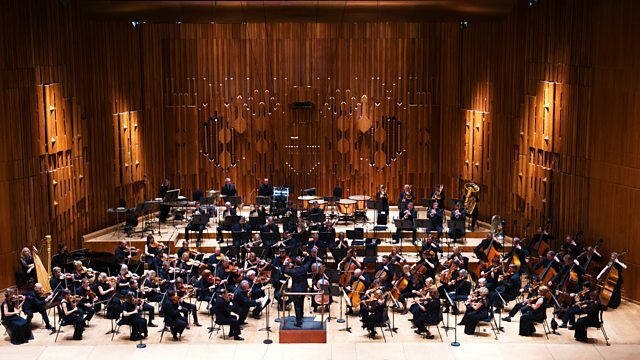 Orchestra: BBC Symphony Orchestra. Conductor: Sakari Oramo. Highlights from the BBC's annual music spectacular from the Royal Albert Hall and beyond.